Background: To determine the feasibility of original aortic valve reconstruction (AVRec) for patients with aortic stenosis (AS), 416 consecutive cases were reviewed. Methods and Results: AVRecs for AS were performed for 416 patients from April 2007 through April 2013. All 416 patients were retrospectively reviewed. One hundred and fourteen patients had bicuspid valves and 16 had unicuspid valves. There were 182 men and 234 women. Mean age was 71.2±12.0 years old. On preoperative echocardiography, peak pressure gradient averaged 79.0±33.6 mmHg. Surgical annular diameter was 20.1±2.8 mm. The procedure is based on independent tricuspid replacement by autologous pericardium using original sizing apparatus and template. There was no conversion to prosthetic valve replacement. There were 8 in-hospital mortalities due to non-cardiac cause. On postoperative echocardiography, peak pressure gradient averaged 21.2±10.7 mmHg 1 week after surgery and 14.3±5.0 mmHg 5.5 years after surgery. Four reoperations were done for infective endocarditis. The other 412 patients had less than mild regurgitation. No thrombo-embolic events were recorded. The mean follow-up period was 25.2±17.5 months. Freedom from reoperation was 96.7% with 73-month follow-up. Aortic stenosis (AS) was recognized in 1672 when Rayger first recorded the osseous fusion of aortic valve cusps at autopsy.1,2 Although aortic valve repair is one of the oldest techniques of open heart surgery, the results after the repair of calcified AS remain unfavorable.3 Since the first successful surgical replacements of diseased heart valves were reported in 1960,4–6 aortic valve replacement (AVR) has been the gold standard for the surgical treatment of AS for the past 5 decades. Given that the major cause of AS is calcifying degeneration of the aortic valve due to the aging process, the prevalence of aortic valve disease is higher among elderly patients.7,8 The natural course of AS is associated with a long latency period followed by the symptomatic period, resulting in a dramatic decrease of survival.9,10 In contrast, 31.8% of patients with severe symptomatic single valvular heart disease had not undergone intervention, most frequently because of comorbidities due to advanced age.11 Trans-catheter AVR (TAVR) is a new alternative treatment for AS in patients considered to be inoperable or at high risk for conventional AVR.12–15 For patients with a small aortic annulus, however, there are no available sizes of trans-catheter prostheses. We have developed a method of aortic valve reconstruction (AVRec) using autologous pericardium.16–18 Given the lack of ideal prosthesis for AS patients, AVRec is thought to be effective for AS, especially with small annulus. The feasibility of the original AVRec for AS was therefore reviewed in this study. Our original AVRec and the clinical study of this procedure were approved by the institutional review board of Toho University Ohashi Medical Center. Additionally, all patients had undergone this operation after written informed consent had been obtained. AVRec for AS was performed consecutively for 416 patients between April 2007 and April 2013. All 416 patients were retrospectively reviewed. One hundred and fourteen patients (27.4%) had bicuspid aortic valves and 16 patients (3.8%) had unicuspid valves. These patients also underwent tricuspidizing AVRec. There were 182 men (43.8%) and 234 women (56.3%). Mean patient age was 71.2±12.0 years (Figure 1). On preoperative echocardiography peak pressure gradient averaged 79.0±33.6 mmHg. The average surgical annular diameter was 20.1±2.8 mm. Based on the criteria of small aortic annulus, that is, diameter ≤21.5 mm, there were 315 patients (75.7%) with small aortic annulus in this study group (Table). We categorized the patients with small aortic valve annulus into group A and the rest into group B. The average aortic valve surgical diameter in group A was 18.8±1.8 mm and that in group B was 23.5±1.9 mm (P<0.01). Mean patient age was 73.0±10.6 years in group A and 65.4±14.1 years in group B (P<0.01). Average preoperative echocardiographic peak pressure gradient through the aortic valve was 82.2±34.5 mmHg in group A and 70.0±27.8 mmHg in group B (P=0.003). Data given as mean±SD or n (%). The autologous pericardium is harvested after routine median sternotomy. In most cases, a 7×8-cm strip of pericardium is sufficient for AVRec. Harvested pericardium is then treated with a 0.6% glutaraldehyde solution for 10 min and then rinsed 3 times with sterilized saline each time for 6 min. Cardiopulmonary bypass is established with aortic and right atrial cannulations. Venous cannula is a single 2-stage cannula unless a concomitant procedure is needed in the right or left atrium. The heart is arrested in diastole by retrograde and antegrade cold blood cardioplegia. Arrest is maintained by cold blood retrograde cardioplegia every 20–30 min and cold blood antegrade cardioplegia every 1 h.
Transverse aortotomy is made 1.5 cm distal from the right coronary ostium. After resection of the diseased aortic valve cusps, the distance between each commissure is measured using a self-developed sizing instrument. Glutaraldehyde-treated autologous pericardium is trimmed with a self-developed template corresponding to the measured value. The annular margin of the pericardial leaflet is then running-sutured to each annulus with 4-0 monofilament sutures. Commissural coaptation is secured with additional 4-0 monofilament sutures. The coaptation of the 3 cusps is then checked with negative pressure on the left ventricular vent. The same tricuspidizing technique is also used for bicuspid, unicuspid, and quadricuspid aortic valve (Figure 2). Tricuspidizing original valve reconstruction of calcified bicuspid aortic valve with autologous pericardium. (A) Preoperative echocardiography showing calcified bicuspid aortic valve; (B) operative view of stenotic bicuspid aortic valve with calcium deposit; (C,D) postoperative echocardiography showing (C) coaptation of 3 pericardial cusps and (D) full opening of 3 pericardial cusps; (E) direct operative view of completed tricuspidizing aortic valve reconstruction: good coaptation was seen under the negative pressure of left ventricle by venting tube. In most cases, the patients do not have anticoagulation postoperatively. Only patients with persistent chronic atrial fibrillation or other valve procedures take anticoagulation. Echocardiography was performed 1 week, 1 month, 3 months, and every 6 months after surgery. Data are given as mean±SD. Survival rate and freedom from reoperation rate were calculated using the Kaplan-Meier method. A total of 201 patients had primary AVRec during the study period. The other 215 patients underwent concomitant procedures: hemi-arch aortic replacement, n=65; coronary artery bypass graft, n=42; and mitral valve repair, n=19. There was no conversion to prosthetic valve replacement. Mean cardiopulmonary bypass (CPB) time was 150.1±29.2 min and aortic cross clamp (ACC) time was 110.1±26.6 min for all 416 patients (Table). Mean CPB time was 150.2±30.3 min for group A and 151.8±25.3 min for group B (P=0.42). Mean ACC time was 110.0±26.9 min for group A and 110.0±25.4 min for group B (P=0.97). There were 8 in-hospital mortalities due to non-cardiac cause. On postoperative echocardiography, peak pressure gradient averaged 21.2±10.7 mmHg 1 week after surgery and 14.3±5.0 mmHg 5.5 years after surgery for all patient categories (Figure 3). The average peak pressure gradient 1 week after surgery was 23.1±11.1 mmHg in group A and 16.0±6.8 mmHg in group B (P<0.01). The average peak pressure gradient 5 years after surgery was 15.6±5.1 mmHg in group A and 15.5±10.6 mmHg in group B (P=0.98; Figure 4). The difference between 1 week and 1 year after surgery was statistically significant, whereas that between 1.5 years and 5 years after surgery, was not. Echocardiographic follow-up: chronological change in (Left) average peak pressure gradient through aortic valve after surgery; and (Right) average grade of aortic regurgitation after surgery. 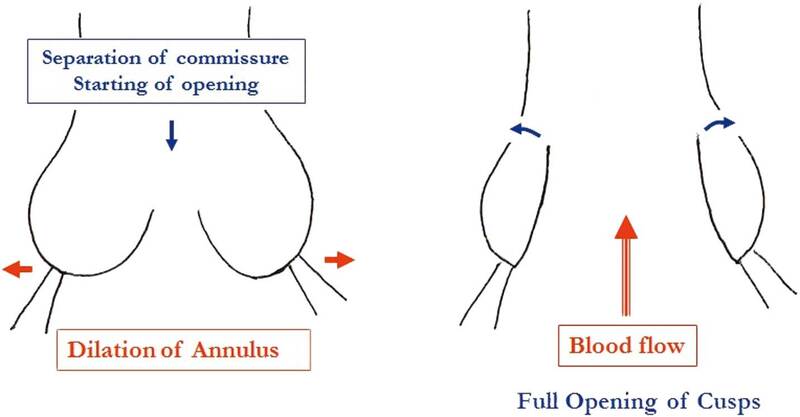 Postoperative peak pressure gradient in patients with small or normal aortic annulus. Four patients needed reoperation because of infective endocarditis. No other causes of reoperation were recorded. The remaining 412 patients had less than mild aortic regurgitation (AR) on their most recent echocardiographic follow-up (Figure 3). No thrombo-embolic events were recorded, and 303 patients were not on anticoagulation postoperatively. The mean follow-up period was 25.2±17.5 months. Survival rate and freedom from reoperation rate were 83.3% and 96.7%, respectively, with 73 months follow-up for all 416 patients (Figure 5). (A) Kaplan-Meier overall survival curve after aortic valve reconstruction for aortic stenosis. Survival rate was 83.3% at 73 months after surgery. (B) Kaplan-Meier freedom from reoperation after aortic valve reconstruction for aortic stenosis. Rate of freedom from reoperation was 96.7% at 73 months after surgery. For aortic valve disease, AVR is still the gold standard of surgical treatment. There is an apparent limitation of durability with bio-prostheses and an apparent disadvantage of anticoagulation with mechanical prostheses. In spite of the recent trend to use more bio-prostheses instead of mechanical prostheses, bio-prostheses cannot create good hemodynamics compared with native aortic valve.24 Calcification can always be a significant issue. With AVRec, however, calcification has never been detected on echocardiography, even in hemodialysis patients after up to 6 years of follow-up. Another issue with prosthetic valve replacement in the aortic position is patient-prosthesis mismatch. In this study, 75.7% of patients had small aortic annulus. This group of patients with small aortic annulus had significantly higher postoperative peak pressure gradient shortly after operation compared with those who did not have small aortic annulus. But, interestingly, this significant difference was totally resolved after a few years of follow-up without any intervention (Figure 4). This kind of remarkable improvement of hemodynamics is one of the distinctive features of AVRec, in contrast to conventional AVR. This might be due to remodeling of autologous pericardial cusps over time: a more natural motion of pericardial cusps has been observed on echocardiography over time. And, even in patients on dialysis, the pericardial cusp motion was natural without calcification during this study period. Furthermore, this operation was able to be completed within the same range of CPB time or ACC time for both the small aortic annulus group and the normal aortic annulus group. Many reports of aortic valve repair are limited to the treatment for AR.25,26 Aortic valve repair to treat AR became feasible with low mortality. It has better results in terms of freedom from valve-related complications compared with conventional AVR.27 The origin of aortic valve repair can be traced back to the early era of cardiac surgery.28 Aortic valve repair has been performed using native valve cusps with various techniques that include commissurotomy,29 annuloplasty, free edge unrolling, cusp resuspension, supra-aortic crest enhancement, free edge reinforcement, wedge resection, and so on.30 This type of conservative repair is not always possible, especially for calcified AS in elderly patients. Simple decalcification or slicing of cusps has not shown good results. With our technique of total resection of all 3 diseased cusps, AVRec can be applied to any type of aortic valve disease. Patients with both AS and AR, even with bicuspid, unicuspid,18 and quadricuspid valves,31 can undergo the procedure, basically in the same fashion. This wide applicability can be attributed also to the independent reconstruction of 3 cusps. The current aortic valve repair for bicuspid aortic valve is mostly bicuspidization. In contrast, we believe that tricuspidization is the ideal reconstructive technique rather than bicuspidization. Tricuspidization can provide larger effective orifice area with longer total length of free margin of aortic valve cusps than bicuspidization. AVRec could make tricuspidization easier than other repair techniques. In a situation with an intact aortic annulus, this new reconstruction technique can be applied to all kinds of aortic valve diseases. And there was no significant difference in postoperative peak pressure gradient between the tricuspid aortic valve group and the bicuspid valve group who underwent tricuspidization in the current study (Figure 6). Postoperative peak pressure gradient for tricuspid aortic valve (TAV) and tricuspidized bicuspid aortic valve (BAV). The use of TAVR in AS treatment, especially for elderly patients, has become a recent topic of discussion. In clinical practice, approximately 30% of patients with severe symptomatic AS do not undergo AVR owing to advanced age, left ventricular dysfunction, or the presence of multiple coexisting conditions.11,32,33 As a less invasive treatment for the patients in this category, balloon aortic valvuloplasty (BAV) and TAVR have been proposed. 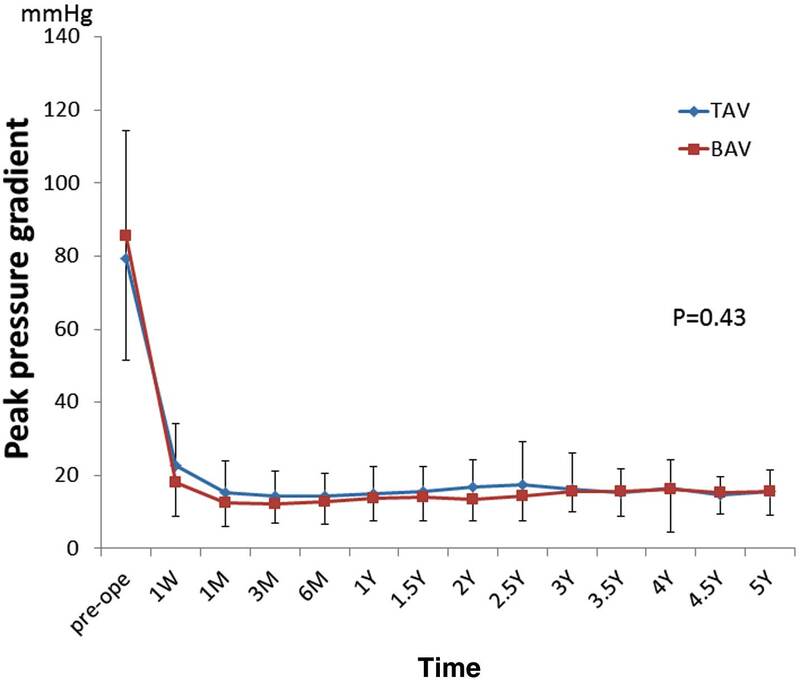 In previous reports on BAV, hospital mortality ranged from 3% to 10%, and 1-year survival was 55–75%.34 In recent reports on TAVR, the rate of death from any cause at 30 days was 3.4%,35 and the rate of death from any cause at 1 year was approximately 25%. In the current study, among 416 patients, in-hospital mortality was 1.9%, and overall survival at approximately 6 years was 83.3%. These data were acceptable compared with those for BAV or TAVR. Additionally, TAVR had a higher rate of stroke.36 In the current study, no thrombo-embolic events occurred after AVRec. Furthermore, TAVR currently has a limitation for small aortic annulus. 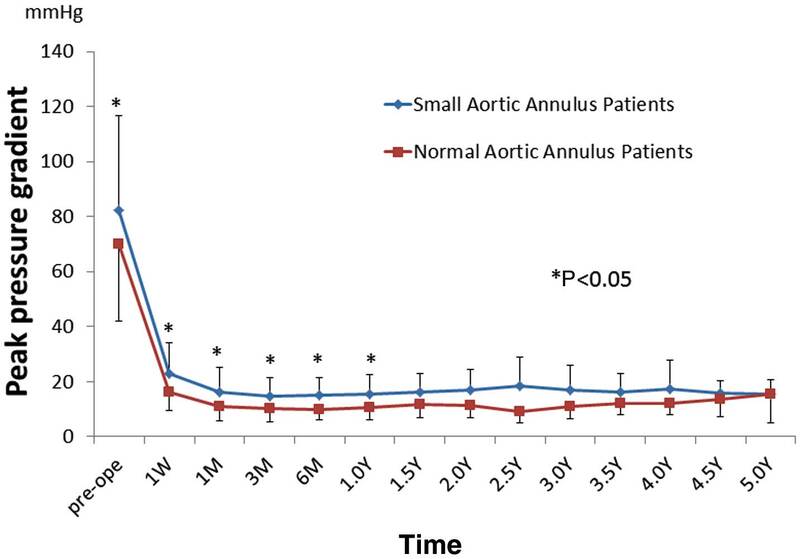 In the current series, mean preoperative surgical annular diameter was 20.1±2.8 mm, and 309 patients (75.7%) were defined as having small aortic annulus. Our original AVRec could be used for patients with small aortic annulus. The smallest annular diameter recorded in this series was 14 mm. We believe that the advantage of AVRec for small aortic annulus is due not only to its technical nature but also to the hypothesized opening and closing mechanism of a native aortic valve. We hypothesize that first in the systole, native aortic annulus dilates, then valve cusps are fully opened by blood flow (Figure 7). These deformation dynamics and mechanical properties of the aortic annulus have been previously reported.37,38 The dilatation of aortic annulus at the beginning of systole increases the effective orifice area, and decreases the stress to the valve cusps. We believe that AVRec could effectively preserve this mechanism of the native aortic valve. This operative method could also preserve the coordination of left ventricle, aortic annulus, sinus of Valsalva, and aorta. As a result, the postoperative hemodynamics are excellent. Hypothesized opening mechanism of native aortic valve during cardiac cycle. First, in systole, the aortic annulus starts to dilate. With this dilatation, the valve cusps start to open. Blood flow from the left ventricle then opens up the aortic valve cusps fully. The cost-effectiveness of TAVR or conventional surgical AVR is often argued.39 In contrast, AVRec is, so far, the most cost-effective procedure, given that it does not require any prosthesis. Medium-term results for our original AVRec for AS were excellent. This operation was feasible for patients with AS. The lack of long-term data will be addressed and resolved in the future. 1. Fokin AA, Robicsek F. Pathogenesis of degenerative aortic valve disease. In: Zembala M, Bockeria LA, Hetzer R, Perier P, editors. Advances and controversies in adult heart valve surgery. Bielsko-Biala, Poland: α-medica press, 2013; 15–35. 2. Bonet T. Sepulchretum sive anatomica practica, 1st edn. Geneva: Cramer and Perachon, 1679. 3. Urbanski PP. Reconstruction of tricuspid aortic valve: A practical perspective. In: Zembala M, Bockeria LA, Hetzer R, Perier P, editors. Advances and controversies in adult heart valve surgery. Bielsko-Biala, Poland: α-medica press, 2013; 48–64. 4. Braunwald NS, Cooper T, Morrow AG. Complete replacement of the mitral valve: Successful clinical application of a flexible polyurethane prosthesis. J Thorac Cardiovasc Surg 1960; 40: 1–11. 5. Harken DE, Soroff HS, Taylor WJ, Lefemine AA, Gupta SK, Lunzer S. Partial and complete prosthesis in aortic insufficiency. J Thorac Cardiovasc Surg 1960; 40: 744–762. 6. Braunwald E. Aortic valve replacement: An update at the turn of the millennium. Eur Heart J 2000; 21: 1032–1033. 7. Tagliari AP, Junior FP, Valle FH, Sant’anna JR, Prates PR, Nesralla IA, et al. Results of aortic valve surgery in patients over 75 years old, at 4.5 years of follow-up. Rev Bras Cir Cardiovasc 2012; 27: 267–274. 8. Nkomo VT, Gardin JM, Skelton TN, Gottidiener JS, Scott CG, Enriquez-Sarano M. Burden of valvular heart diseases: A population-based study. Lancet 2006; 368: 1005–1011. 9. Frank S, Johnson A, Ross J Jr. Natural history of valvular aortic stenosis. Br Heart J 1973; 35: 41–46. 10. Otto CM, Bonow RO. Valvular heart disease. In: Bonow RO, Mann DL, Zipes D, Libby P, Braunwald E, editors. Braunwald’s heart disease: A textbook of cardiovascular medicine, 9th edn. St. Louis, MO: WB Saunders, 2011; 1468–1477. 11. Iung B, Baron G, Butchart EG, Delahaye F, Gohlke-Barwolf C, Levang OW, et al. 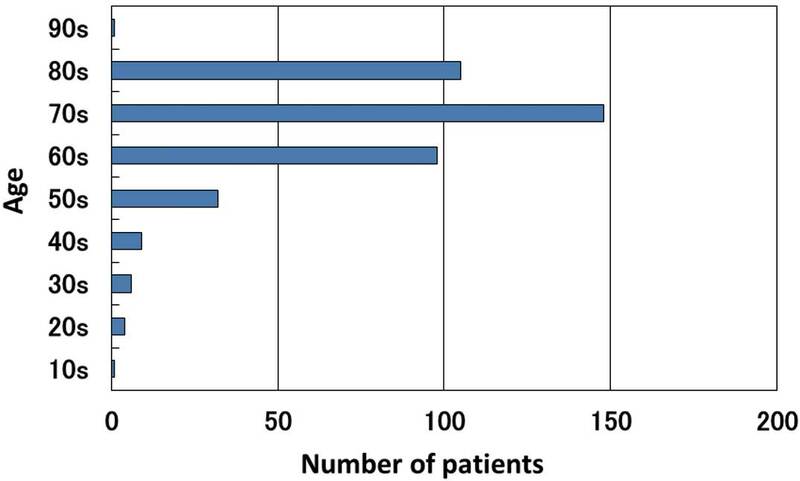 A prospective survey of patients with valvular heart disease in Europe: The Euro Heart Survey on Valvular Heart Disease. Eur Heart J 2003; 24: 1231–1243. 12. Cribier A, Eltchaninoff H, Bash A, Borenstein N, Tron C, Bauer F, et al. Percutaneous transcatheter implantation of an aortic valve prosthesis for calcific aortic stenosis: First human case description. Circulation 2002; 106: 3006–3008. 13. Leon MB, Smith CR, Mack M, Miller DC, Moses JW, Svensson LG, et al. Transcatheter aortic-valve implantation for aortic stenosis in patients who cannot undergo surgery. N Engl J Med 2010; 17: 1597–1607. 14. Conradi L, Seiffect M, Treede H, Silaschi M, Baldus S, Schimer J, et al. Transcatheter aortic valve implantation versus surgical aortic valve replacement: A propensity score analysis in patients at high surgical risk. J Thorac Cardiovasc Surg 2012; 143: 64–71. 15. Grude E, Schuler G, Buellefeld L, Gerckens U, Linke A, Wenaweser P, et al. Percutaneous aortic valve replacement for severe aortic stenosis in high-risk patients using the second- and current third-generation self-expandable core valve prosthesis. J Am Coll Cardiol 2007; 50: 69–76. 16. Ozaki S, Kawase I, Yamashita H, Uchida S, Nozawa Y, Takatoh M, et al. A total of 404 cases of aortic valve reconstruction with glutaraldehyde-treated autologous pericardium. J Thorac Cardiovasc Surg 2014; 1: 301–306. 17. Ozaki S, Kawase I, Yamashita H, Uchida S, Nozawa Y, Matsuyama T, et al. Aortic valve reconstruction using self-developed aortic valve plasty system in aortic valve disease. Interact Cardiovasc Thorac Surg 2011; 12: 550–553. 18. Kawase I, Ozaki S, Yamashita H, Uchida S, Nozawa Y, Matsuyama T, et al. Aortic valve reconstruction of unicuspid aortic valve by tricuspidization using autologous pericardium. Ann Thorac Surg 2012; 94: 1180–1184. 19. Ozaki S, Kawase I, Yamashita H, Uchida S, Nozawa Y, Takatoh M, et al. Reconstruction of bicuspid aortic valve with autologous pericardium: Usefulness of tricuspidization. Circ J 2014; 78: 1144–1151. 20. Yaku H. Aortic valve reconstruction with autologous glutaraldehyde-treated pericardium: A new paradigm for aortic valve surgery? Circ J 2014; 78: 1063–1065. 21. Faggiaro P, Antonini-Ganterin F, Baldessin F, Lorusso R, D’Aloia A, Gas LD. Epidemiology and cardiovascular risk factors of aortic stenosis. 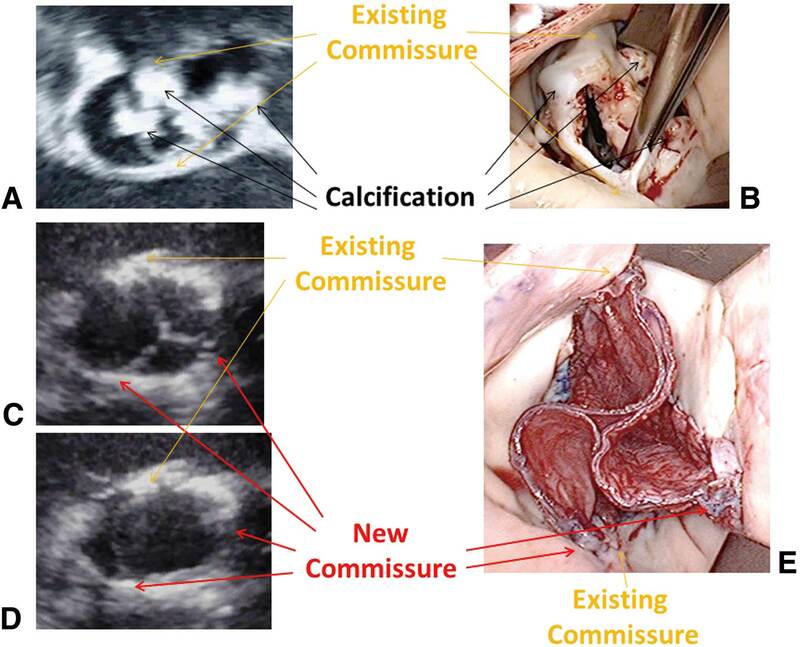 Cardiovasc Ultrasound 2006; 4: 27. 22. Manning WJ. Asymptomatic aortic stenosis in the elderly: A clinical review. JAMA 2013; 310: 1490–1497. 23. Stewart BF, Siscovick D, Lind BK, Gardin JM, Gottdiener JS, Smith VE, et al. Clinical factors associated with calcific aortic valve disease: Cardiovascular Health Study. J Am Coll Cardiol 1997; 29: 630–634. 24. Ozaki S. Pathophysiology of calcification of bioprosthetic heart valves: An experimental investigation. Acta Biomedica Lovaniensia 2001, no. 238. Belgium: Leuven University Press, 2001. 25. Lansac E, Di Centa I, Raoux F, Al Attar N, Acar C, Joudinaud T, et al. A lesional classification to standardize surgical management of aortic insufficiency towards valve repair. Eur J Cardiothorac Surg 2008; 33: 872–880. 26. Doss M, Sirat S, Risteski P, Martens S, Moritz A. Pericardial patch augmentation for repair of incompetent bicuspid aortic valves at midterm. Eur J Cardiothorac Surg 2008; 33: 881–884. 27. Aicher D, Fries R, Rodionycheva S, Schmidt K, Langer F, Schafers HJ. Aortic valve repair leads to a low incidence of valve-related complications. Eur J Cardiothorac Surg 2010; 37: 127–132. 28. Lillehei CW, Gott VL, DeWall RA, Varco RL. The surgical treatment of stenotic or regurgitant lesions of the mitral and aortic valves by direct vision utilizing a pump oxygenator. J Thorac Cardiovasc Surg 1958; 35: 154–191. 29. Hill DG. Long term results of debridement valvotomy for calcific aortic stenosis. J Thorac Cardiovasc Surg 1973; 65: 708–711. 30. Duran CMG, Alonso J, Gaite L, Alonso C, Caqiqas JK, Marce L, et al. Long-term results of conservative repair of rheumatic aortic valve insufficiency. Eur J Cardiothorac Surg 1988; 2: 217–223. 31. Kawase I, Ozaki S, Yamashita H, Uchida S, Nozawa Y, Matsuyama T, et al. Original aortic valve plasty with autologous pericardium for quadricuspid valve. Ann Thorac Surg 2011; 91: 1598–1599. 32. Varadarajan P, Kapoor N, Bansal RC, Pai RG. Clinical profile and natural history of 453 nonsurgically managed patients with severe aortic stenosis. Ann Thorac Surg 2006; 82: 2111–2115. 33. Bach DS, Siao D, Grard SE, Duvernoy C, McCallister BD Jr, Gualano SK. Evaluation of patients with severe symptomatic aortic stenosis who do not undergo aortic valve replacement. Circ Cardiovasc Qual Outcomes 2009; 2: 533–539. 34. Otto CM, Mickel MC, Kennedy JW, Alderman EL, Bashore TM, Block PC, et al. Three-year outcome after balloon aortic valvuloplasty: Insights into prognosis of valvular aortic stenosis. Circulation 1994; 89: 642–650. 35. Smith CR, Leon MB, Mack MJ, Miller DC, Moses JW, Svensson LG, et al. Transcatheter versus surgical aortic-valve replacement in high-risk patients. N Engl J Med 2011; 364: 2187–2198. 36. Makkar RR, Fontana GP, Jilaihawi H, Kapadia S, Pichard AD, Douglas PS, et al. Transcatheter aortic-valve replacement for inoperable severe aortic stenosis. N Engl J Med 2012; 366: 1696–1704. 37. Hamdan A, Guetta V, Konen E, Goitein O, Segev A, Raanami E, et al. Deformation dynamics and mechanical properties of the aortic annulus by 4-dimensional computed tomography. J Am Coll Cardiol 2012; 59: 119–127. 38. Lansac E, Lim HS, Shomura Y, Lim KH, Rice NT, Goetz W, et al. A four-dimensional study of the aortic root dynamics. Eur J Cardiothorac Surg 2002; 22: 497–503. 39. Osnabrugge RL, Head SJ, Genders TS, Van Mieghem NM, De Jaegere PP, Van der Boon RM, et al. Costs of transcatheter versus surgical aortic valve replacement in intermediate-risk patients. Ann Thorac Surg 2012; 94: 1954–1960.